As we ring in the new year, our team reflects on a very important milestone from 2018 – 25 years of business! I feel so fortunate to have spent 25 amazing years serving southeast Michigan. We’re going into our 26th year; it reminds me of how much we’ve accomplished together. When I started Bloomfield Construction two and a half decades ago, I was a one-man shop, working on various home construction projects. Soon after, I hired my mom to help with bookkeeping. Within three years, I enlisted the help of a college roommate for sales. A lot has changed since then. Nearly 20 employees now support our restoration home improvement and commercial construction projects throughout Southeast Michigan. Michigan’s homes, landscape and weather has also changed quite a bit over the years. It’s been great getting to know so many home and business owners as our company has expanded. Though meeting Michigan homeowners sometimes happens during times of tragedy, like fire damage repairs or basement flooding, others have allowed us to flex our creativity as we design new home exteriors. Throughout it all, we hope these 25 years have provided peace of mind to those we’ve served. We’ve created a company we’re proud of. One that provides high-quality products and services to protect our customers from unnecessary costs and risks. We never cut corners, and always work to find a solution that works best now and for the future. When I started Bloomfield Construction, I specialized in roofing and siding services. As I was working throughout the community, I began supporting other home projects and eventually commercial construction as well. We now offer a wide range of home and commercial construction and restoration services, and expanded our team to support these projects. Professional construction projects require more than tools like hammers and saws. New technologies allow us to improve the efficiency and effectiveness of our projects. We regularly attend conferences, like the James Hardie Siding Contractor Summit, to learn more about the industry and equipment evolutions, and consistently learn about new solutions we can offer. From simple text message pictures to evaluate a project before it starts to using drone technology to evaluate roofing conditions, our teams can provide accurate quoting more quickly than ever before. Our thermal camera imagining lets us see moisture that the eyes often miss. 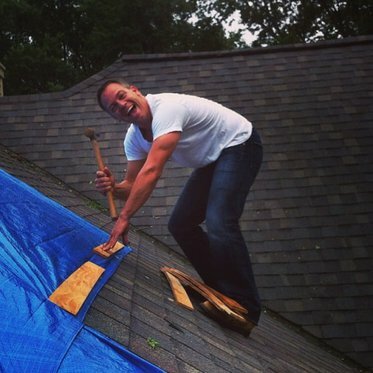 And roofing, siding and restoration materials are constantly changing and improving. We’re always looking for a better way. This protects your family or business from unexpected expenses and inaccurate project timelines. Our teams are armed with the experience and equipment necessary to get it done right – always enlisting the latest technology and supplies. In 2015, we moved from our beloved home on Telegraph, where we’d spent 20 years, to a new location at 2035 Franklin, Bloomfield Hills MI 48302. With more than four times the space of our old building, the Franklin office supports all divisions of Bloomfield Construction & Restoration under one roof. This has streamlined communication and processes, allowing us to better support our customers. When I started the business, we were ‘Bloomfield Construction.’ As our partnerships with local homeowners and insurance companies have grown, so has our dedication to emergency insurance repairs. Our new website allows us to share service offerings as we add “Restoration” to our company name: Bloomfield Construction and Restoration. Commercial roofing has also become an important part of supporting our community. We recently launched Bloomfieldcommercialroof.com to highlight our Commercial Roofing Replacement and Coating Services. Whether it’s our commercial coating, which can save business owners 50% compared to tear off and replacement, or fully recovering your flat roof – we’ve helped many Michigan businesses find the right solution. appearances of so many neighborhoods. Our dedication to the community spreads beyond Michigan as we’ve travel to support those struck by the tragedy of hurricane damage. Our teams have repaired storm damaged homes in South Carolina, Texas and Florida. No matter where we’re working, our dedication to quality work remains the same. We’ve seen a lot over the years. From failures of many other construction companies… to visiting raccoons and cars on roofs, there have been a lot of interesting projects along the way. To the thousands of families that we’ve served over the last 25 years – thank you. Thank you for inviting us into your homes and businesses and letting our team do what they love most. Thank you for supporting our growth by telling your friends and family about our work, for posting on social media and Google reviews after you have a positive experience, and for staying in touch over the years. 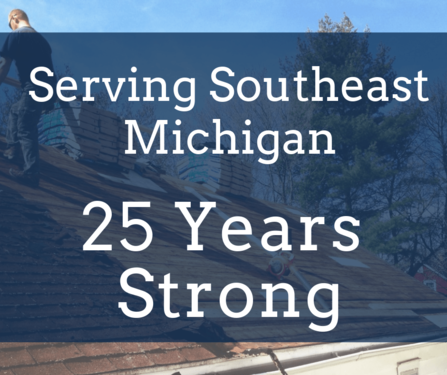 Here’s to the next 25 years of serving home and business owners throughout Southeast Michigan! Ready to work with the experts for your home improvement or restoration project?